This is the first approach of business management . 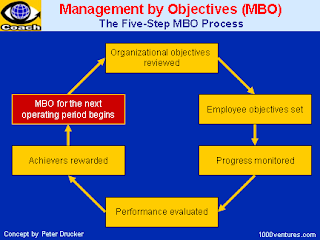 According to this approach , every work is done by reviewing the organisation objectives . After this each employee sets his objectives . His performance is monitored by higher officers . Then performance is evaluated after certain period . If anybody whose performance is favourable , that person is given award . After this Management by objective process is started again . This is the second approach of management . According to this approach . Under scientific system of management , different employee's responsibilities are defined and group of employees are also allowed cost and revenue centers . After this environmental factors are also identified . Now all work is done according to system . So this approach is called management by system . This is that approach of management in which every employee of company works under strict control of employer and he is responsible for giving result by doing his work other wise he can also be transferred or dismissed or suspend or demotion from the post . In this approach , all the activities of management of business is done under co-operation and co-ordination of all employees of company and This approach is very democratic and one of best approach in the world ..